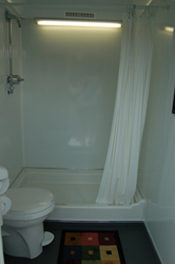 The Royal Restrooms Three-Stall Portable Shower Unit is a simple solution for events such as weekend festivals or for use at certain job sites. 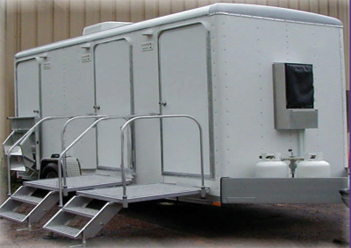 This mobile shower unit may be combined with additional Royal Restrooms for large events. 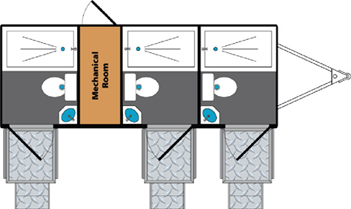 Originally designed for disaster relief efforts, the Royal Restrooms Three-Stall Shower Unit is the perfect choice for emergency situations or in any case where power and water sources are not readily available. The unique design of Royal Restrooms gives them the mobility to go virtually anywhere. 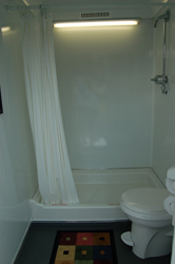 The Three-Stall Shower Unit is completely self-contained and operable using (1) 110 volt outlet or generator for the lights, heat or air conditioner, and on-demand propane water heater. (Unit pulls a maximum of 20 amps.) Water is supplied by a spigot and garden hose or a 125 gallon on-board fresh water holding tank. The unit houses a 380 gallon waste holding tank; grey water from the showers can either flow directly into the waste holding tank or be diverted to a specific location on the ground. If operated from a continuous water source, the unit provides approximately 450 hot showers before the propane needs to be replenished. Rental options include daily, weekly, and long-term rentals, generators, and additional fresh water holding tanks. Pricing and availability may be obtained by contacting your local Royal Restrooms office. 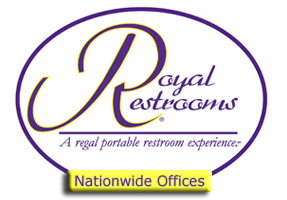 Please visit our website or call the Royal Restrooms Corporate Office at 800.969.7434 for local contact information.